We are located in the peaceful country surroundings of Lordstown, Ohio. Situated on five acres, our kennel not only offers a secure, state-of-the-art facility for your pet’s visit, but also plenty of fresh air and sunny skies for an anxiety-free stay. Our Northeast Ohio location is within minutes of Warren, North Jackson, Austintown, Niles, and Newton Falls. Our location provides easy access to the Ohio Turnpike and Interstates 76 and 80. You should bring your pet’s bed, favorite toy and treats, except “Greenies,” rawhide and pig ears. These may present choking hazards to your pet. We provide bowls for food and water and Iam’s Bite Size or BilJac feed. We feed our feline guests dry Purina Cat Chow. You may bring the food that your pet enjoys at home. What vaccination records to I need to bring? We require proof of current vaccinations administered by a veterinarian for rabies, DHLPP, and Bordatella (kennel cough) for all canines. Cats must have proof of a feline distemper and rabies vaccinations. Please bring these records with your pet. 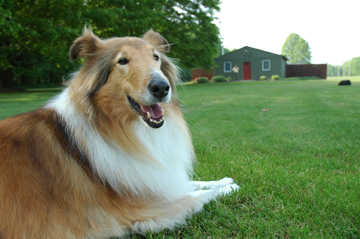 Lordstown Country Kennel offers 20 indoor/outdoor runs for your dog’s comfort and protection. 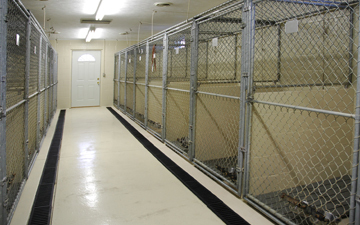 Each run is self-contained with a 4’ by 4’ inside kennel attached to a 4’ by 12’ outside exercise run. All runs feature block construction on the lower part of the run to provide privacy for all visitors. The outside runs have a concrete pad to allow for cleaning and sanitizing. Let’s not forget our feline guests! 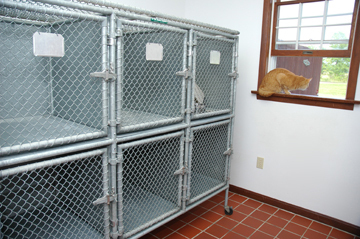 Lordstown Country Kennel provides a separate facility for our feline guests where they cannot hear or smell the dogs. For your cat’s enjoyment, our cat room has a window providing bright, natural light during the day and a starry sky at night.